HCM CITY – The recent instances of cooking gas cylinders exploding is due to fraudulent practices by suppliers, the Ministry of Industry and Trade has said. The Việt Nam Gas Association explained that many suppliers illegally appropriate empty cylinders belonging to other brands, abrade their label and logo, and put their own on them to save the cost of buying quality gas tanks themselves. The scraping thins the surface, meaning the cylinder no longer has the same capacity to withstand gas pressure, thus posing a high risk of explosion. Dương Thanh Hoàng, deputy manager of the Market Surveillance Branch, said the tanks are taken to faraway places for the alteration so that the fraud is not discovered easily. There has been a number of cases of exploding cylinders recently. In Hà Tĩnh Province, for instance, a mini gas tank in a sausage stand exploded during a school fair on February 5, splashing oil and injuring seven students. The dubious cylinders, which are slightly cheaper, are usually sold to industrial parks or poor households. Since October last year authorities have carried out 2,359 raids, seized 1,781 cylinders and 15,546 mini tanks and shut down 10 gas-filling shops. 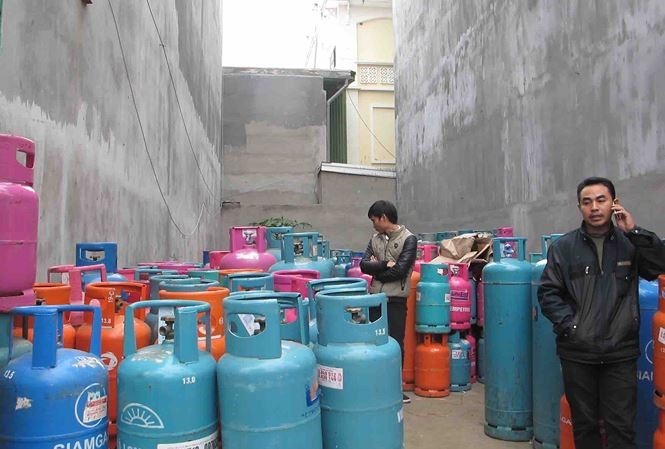 In HCM City alone they investigated 111 cases and found 84 of them violating regulations, fined them over VNĐ600 million and seized nearly 2,600 mini gas tanks, 1,200 empty mini tanks and hundreds of 12kg cylinders, the most common size used by households. But Hoàng admitted this was merely the tip of the iceberg. The association said different authorities use different methods to deal with fraud, and there should be a clearer, common guideline for them.